It you need a smile today, here you go! Our team is wishing Wally a speedy recovery. 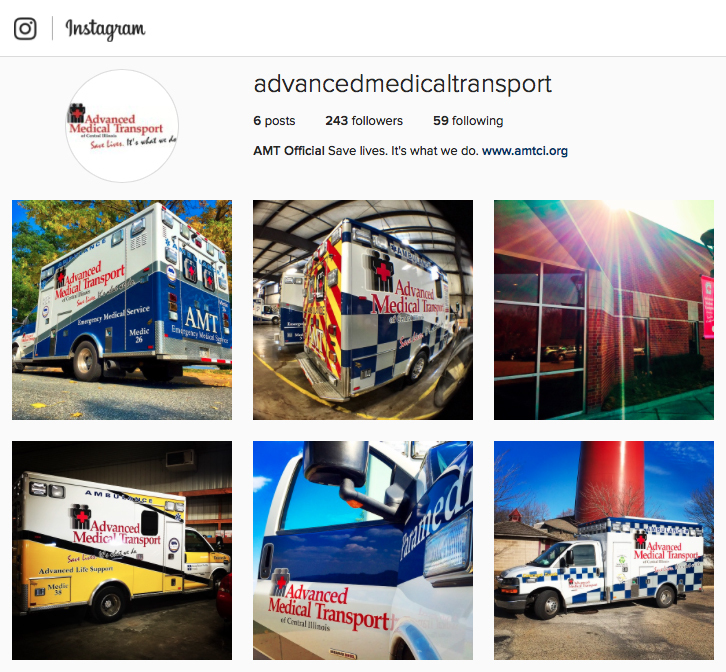 #TeamAMT cares about the community in which we live and work. We are so proud of our employees and their many contributions throughout the year to so many local charities. February is Heart Month, and on the heels of the @American Heart Association of Peoria's Heart and Stroke Ball, we'd like to again share the story of Mr. Domico. Please help us spread the word that CPR and AED use saves lives! Please support this young man in his mission to bring library services to his community! We are a little bit extra proud of Logan because he is the son of AMT Quad Cities EMT Brandon Brinson. Heart of the Flame Photography shared some pictures of our crews standing by at a residential fire. Our team's thoughts are with those affected by the incident. Thank you to Valeska Hinton Early Ch Ed Ctr for having us stop by to talk about ambulances and the importance of being good "helpers" in the community. Photo courtesy of Clarissa Haywood. Here is the official information for the next Creighton University/Advanced Medical Transport Paramedic program. It was a big day at Methodist College for the Sterling Middle School Healthcare Careers Fair! Thank you, Ms. Patterson for your very kind words! Sheriff Thompson is continuing to urge motorists to exercise caution as another winter storm comes later this afternoon. The Black Hawk County Sheriff's Office has been inundated with accidents over the last few weeks and many of these accidents have been preventable, most attributable to excessive speed when considering weather and road conditions. "Our best advice is not to travel when the road conditions deteriorate, if you must travel; we really need motorists to slow down" Sheriff Thompson said. Attached to this news release is a video of a collision that occurred yesterday on I-380 near Raymond, when two Black Hawk County deputies were at the scene of a car in the ditch. Another vehicle lost control and narrowly missed one patrol car and then hit the other patrol car. Fortunately, the deputy was out of his car and in the ditch and was not injured; the driver of the vehicle was not injured either. Support one of our long-time team members! These are some of of our shining @TeamAMT stars! Thanks to WMBD for visiting today. Congratulations to Streator Paramedic Shannan!! A look at how pre-hospital emergency healthcare has evolved in Peoria. Thank you to Peoria Magazines! A close friend of our Quad Cities crew is making a great recovery. Keep up the good fight, Adam! Our QC crews want to remind everyone to allow a little extra time for travel this weekend. We want everyone to stay safe. Photo courtesy of Justin Ploog. We are very excited here at AMT to have these young men and women join our team! We look forward to growing their knowledge and sharing our experience in healthcare and community involvement. If you read one story today, make it the one about a remarkable young man - an inspiration to us all. Lt. Hosette worked right alongside some of our Quad Cities team. Service are scheduled for Saturday. Our QC crew and our entire team send their condolences to our neighbors in Clinton. Our team is our greatest asset. Thank you, CWTC, for making our team that much greater!